Railways were not entirely unknown in the first quarter of the 19th century. Horse-drawn wagons travelling on timber rails — later iron rails — were widely used for local freight transport, such as moving coal from mines to distribution points, which was the practice in Britain from the 17th century onwards. A sudden increase in railway building was prompted by a realisation that steam locomotives were superior to horse traction. In 1804, Richard Trevithick (1771-1833) was the first to demonstrate the potential of steam locomotives, and George Stephenson (1781-1848) began building locomotive engines in 1814, one of which operated in Scotland in 1816 on the Kilmarnock & Troon Railway, a line that would be upgraded by Miller in 1846-7. Engineers, landowners and manufacturers saw the possibilities and envisaged a countrywide rail network, opening up trade centres and creating demand for services and goods. Miller became a joint partner in Thomas Grainger's engineering and surveying firm in 1825, when he was only 20 years old, though he had worked with Grainger for up to two years before that. They embarked together with considerable enthusiasm on a journey into the new world of railways and its feverish pace of construction, working from offices in Castle Street, Edinburgh. The first project they worked on together was the Monkland & Kirkintilloch Railway in Lanarkshire, which was their debut in railway engineering. Grainger obtained a private Act of Parliament for its construction on 17th May 1824. The 16.1km long, 4ft 6in (1.37m) gauge railway began as a horse-drawn line. Steam locomotives were introduced later — the first to be built in Scotland. The line ran from the ironworks at Monkland north west to Kirkintilloch on the Forth & Clyde Canal, with short branches to Kipps and Dundyvan totalling 1.2km. It opened on 1st October 1826. The line's construction and operation were compared unfavourably with those built later. However, it was one of the first schemes on what was to be a steep learning curve for all early railway engineers. While it was under construction, Grainger and Miller were hard at work on the surveys and designs for the Ballochney Railway and the Garnkirk & Glasgow Railway. The Parliamentary Bills for these 4ft 6in (1.37m) gauge Lanarkshire railways received royal assent in May 1826 — Ballochney on the 19th and Garnkirk & Glasgow on the 26th. The 8km long Ballochney Railway ran north east from the Monkland & Kirkintilloch Railway at Kipps, via Ballochney to Arbuckle. It had branches to Airdrie, New Monkland, Clerkston, Stanrig, Whiterig and Blackrig, and it began operating on 8th August 1828. The Garnkirk & Glasgow Railway is the first for which Miller is described equally with Grainger as engineer. The line was 13.2km long and joined the Monkland & Kirkintilloch Railway near the ironworks at Gartsherrie, running west via Garnkirk to St Rollox in north Glasgow. It was designed for steam locomotives. In January 1831, Grainger and Miller stated their opinion of steam power as: "The decided superiority which Railways, combined with Locomotive Engines, possess over every other communication, seems to be admitted by every unprejudiced man who has paid the least attention to the subject". The Garnkirk & Glasgow Railway opened in May 1831 for goods transport and was fully operational on 27th September 1831. At the opening ceremony two locomotives travelled the line. Grainger rode on the St Rollox. Miller on the George Stephenson, whose namesake had provided planning advice and drove the locomotive himself. Both engines were built by Robert Stephenson at the Newcastle upon Tyne works. As before, other railway projects were being developed while the Garnkirk & Glasgow Railway was under construction. The two engineers worked on the Wishaw & Coltness Railway and the Polloc & Govan Railway. An Act of Parliament authorised the Wishaw & Coltness Railway in Lanarkshire on 21st June 1829. It too had a 1.37m gauge and joined with the Monkland & Kirkintilloch, at Coatbridge, passing south of Jerviston and Wishaw to end at Chapel. Part of the line opened in 1833, with the route to Jerviston open on 21st March 1834 and a new branch to Cleland completed in 1841. The lengthy project concluded when the whole 17.75km became operational on 9th March 1844. The Polloc & Govan Railway bill received royal assent on 29th May 1830. This railway covered just 1.9km in the city of Glasgow and opened in August 1840. Meanwhile, Miller married Isabella Ogilvie (1799-1876) on 1st December 1834. He was 29 years old and Isabella was five years older. Her parents were Perth merchant Duncan Ogilvie and Janet Thomas, who had married in May 1797 and raised three sons and three daughters. Isabella was their second child and eldest daughter. Miller's reputation was growing, and ultimately it would eclipse Grainger's. The opening of the Garnkirk & Glasgow Railway marked a change in their working relationship and they pursued more separate projects within the partnership. They worked together on only one more railway initiated after 1835 — the 4.8km long Paisley & Renfrew Railway, another 1.37m gauge line, linking Paisley and Renfrew. It was authorised on 21st July 1835 and opened on 3rd April 1837. Miller and Grainger also collaborated on a proposal for a line from Brechin to Montrose in Angus on the east coast, which had been surveyed initially by fellow Scottish engineer Robert Stevenson (1772-1850) in the 1820s. The scheme came to nothing and in 1837 they were still waiting to be paid. By 1835, Miller and his wife were living at 50 Northumberland Street in Edinburgh, and it was here that their first child, Margaret, was born on 20th September 1835. The family moved to 23 Rutland Street in the city before their second child arrived — Isabella was born on 20th April 1838. The couple would produce three more children: their only son John (23rd December 1840), Jessie born on Miller's 37th birthday (26th July 1842) and Mary (21st March 1844). 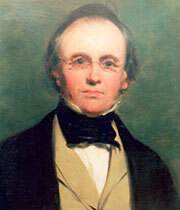 From 1835 onwards, Miller poured his engineering expertise into a huge number of railway schemes, as well as surveying and civil engineering work. Grainger pursued railway projects of his own. In 1845 they would decide to dissolve the partnership, and Grainger was to die as a result of a railway accident just seven years later. in this case a worn piece of plateway, possibly from the Kilmarnock Foundry, found at Laigh Milton Viaduct on the Kilmarnock & Troon Railway. 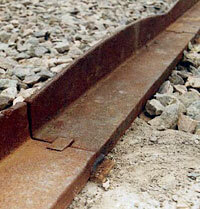 Plateways were used by wagons drawn by teams of horses.